I recently saw a post on StackExchange where a user was having a problem with tempdb filling up, which was causing their logon trigger to fail. 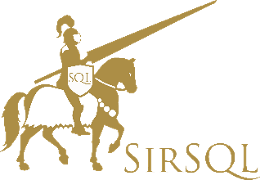 The logon trigger was attempting to prevent users from connecting with SQL Server Management Studio (SSMS). 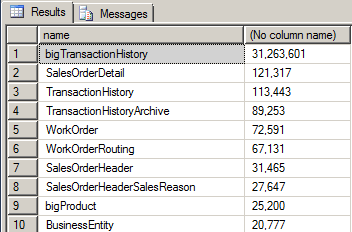 It seems that the user was not aware that it is trivial to connect using SSMS to SQL bypassing the app level restriction in place. Looks like it’s working just fine. So let’s circumvent this, try connecting again, this time we just need to edit the Additional Connection Parameters in the connection dialog and pass along a new application name. And now the connection will work just fine, completely bypassing the trigger (if trying this, don’t forget to disable your trigger when done). I’ve been working with some large data load processes recently and have been dumping upwards of a billion records into tables. As these are not instantaneous loads I found myself wanting to keep an eye on how much data was loaded. This is all good and well, but when you start getting to large values on the tables it becomes a little difficult to tell the difference between 31 million and 312 million. That’s when I resort back to using commas. Unfortunately SQL Server does not make this easy, although it can be accomplished with a couple of converts. This is still a little arduous to type, so I created a function to do the work. Now it’s just a case of calling that function whenever I want to have the numbers presented to me in a much more readable format. It’s nice to have friends, why aren’t you a friend of extended properties? They can make your like so much easier by helping to document your databases and objects. Pretty simple and we can infer a lot of the information about the table, but we mention size, are we measuring in inches, feet, yards? We can add extended properties that will help to provide that sort of guidance for someone to reference later on. This give you a really quick and easy way to document your objects. I highly recommend that during your next development project that you make life easy for yourself and add extended properties to your objects (and trust me, your DBA will thank you). As a follow up to last weeks post on quickly restoring multiple databases to default locations I’ve another script which might help you with quick deployments. Last week I covered restoring the databases, I also needed to get log shipping setup for multiple databases. If you’ve ever had to configure log shipping you know that there’s lots of clicking and typing of things and entering information. It’s a bit of a pain for a single database, when you have to set it up for multiple databases it’s a long, slow, time consuming nightmare. I’d had enough of dealing with this so I put together a script that will do the complete configuration of the primary and secondary servers with a single execution. The key to doing this is using SQLCMD mode from within SSMS. This allows you to do some special things, like parameter substitution and, key to what I’m doing, change connections as a part of the script. Try the following, replacing PrimaryServer and SecondaryServer with something relevant to your environment. As you can see from the script it connected to each server in turn and grabbed the @@SERVERNAME value. That’s pretty special. My log shipping script does very much the same thing. You just provide the primary and secondary servers, the file locations for the transaction log backups and the name of the database. The script takes care of the rest. It will perform a very basic check to ensure that the local backup directory exists and error if not. The script also does not encompass a log shipping monitor server and has a default of 15 minutes for the backup/copy/restore processes. All of that could be quickly adjusted and made additional parameters. Of course this doesn’t answer the question of when or why you would use log shipping, that’s for another post. Who Owns Your Databases And Jobs? Quick question, who owns your databases? And how about your jobs? Don’t know? Go find out…now find out without using the GUI. Querying sys.databases will give you the owner_sid. The trouble is that you have to relate that owner_sid back to a user. The same with sysjobs, that sid needs to relate to someone. Now what, how can you quickly and easily get the owner? A little known system function will come to the rescue. There’s some great little hidden gems lying around in SQL Server like this. You just need to find them. If you work with financial data or have to do regular reporting type functions then I’m sure you currently use some kind of funky function/case statement to figure out what the last day of the month is and something even more funky to find the last day of next month or the month after. 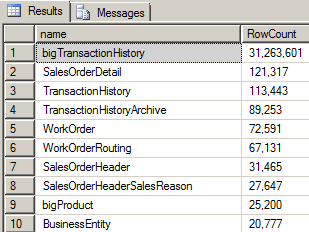 SQL Server 2012 fixes that for you with the introduction of the EOMONTH function. It even handled the leap year correctly. Simplicity itself. A great addition.